If you are a member of AccessArt then please use this form if you would like to suggest a visual arts planning topic that you would like help with. You can see all of the current topics in our visual arts planning series here. Please feel free to add links to other resources, or share your experiences and ideas, via the comments box below. Artist and educator Hannah Coulson shares a trio of musical activities that combine an exploration of drawing and music: the first, takes two contrasting elements to create a mythical instrument, explored through drawing and play. 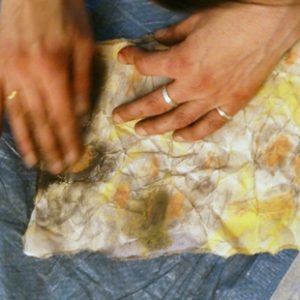 The second workshop shares ideas for large scale, collaborative drawings made in response to music. The final activity lets participants draw a self-portrait of themselves with an invented instrument, to create a colourful and original orchestra. 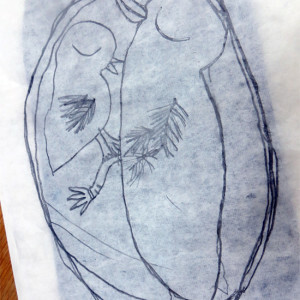 Artist Tracy McGuiness-Kelly shares a drawing workshop that could also be used as part of a mini-beast project. Children have the opportunity to explore different qualities of line and markmaking to create their own designs based on the spiral. 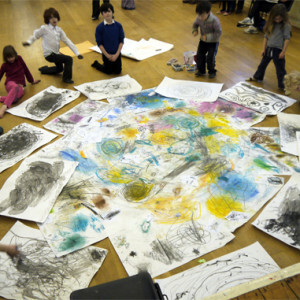 The drawings can then be mounted altogether to make a large collaborative drawing. A simple but exciting warm up exercise for tuning into the drawing process and for breaking pre-conceived ideas about ‘what is drawing?’ or ‘why draw?’. 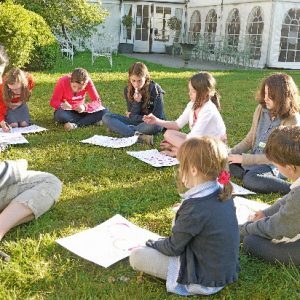 This drawing game can also be developed to tune a group into creative, group thinking and as a creative thinking and exploring exercise. Each participant makes a drawing and then passes it to their neighbour who draws in response to the existing lines and marks. 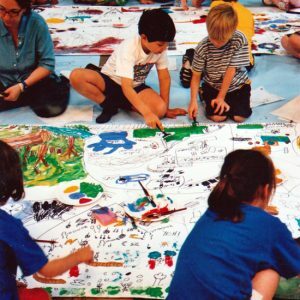 AccessArt have used this drawing game with children as young as 5. Young children create richly illustrated narratives using toys, poetry and their own text. The children can take their inspiration from either a line of poetry, or a descriptive sentence which they have written themselves and then they draw from small scenes that they have set up using their toys. 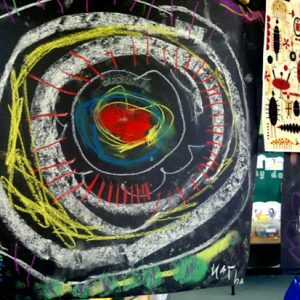 This workshop enables children to respond to working from life and yet at the same time create a narrative drawn from their inner world. Paula Briggs leads a two-part drawing session in which children draw their spell ‘ingredients’ using a variety of media and then through further collaborative drawing, turn them into a turbulent, dynamic, shared magic spell pot! A drawing project using carbon paper and collage. Children are encouraged to explore diverse mark making to create collaged drawings of eggs and then they are asked to imagine what might be hatching in the egg….Birds…Dragons? This is an activity that could be rewarding to develop further using the ‘hidden/revealed’ element of both the process and the theme. Sheila Ceccarelli leads children in an exploration of Georges Seurat’s ‘Bathers at Asnières’ (1884, National Gallery, London). 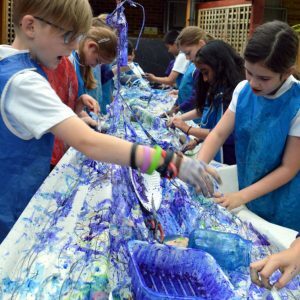 Using masking tape, markers, graphite, oil pastels, paint and ink, the children enjoy the freedom to explore process and materials, creating a layered drawing and ‘wax resist’ on a massive scale as they imagine the sounds and feel of a river. 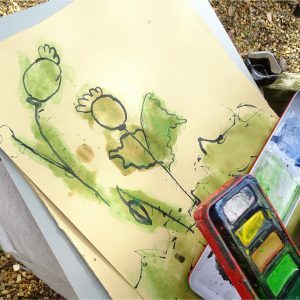 This workshop using feathers, watercolours and ink is based on the notion of Myriorama cards and encourages children to take inspiration from observational drawing and then let their drawings evolve into something more personal and expressive, discovering and creating new landscapes and spaces. 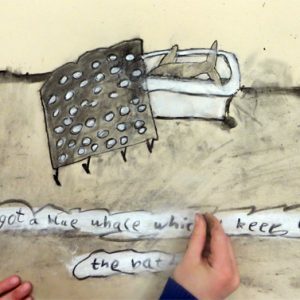 This is a simple drawing project that gives participants plenty of opportunity to make their drawing their own by experimenting with a range of media and materials. The challenge is to fill the whole page and turn the paper into fur by markmaking, destroying and creating, rather than just drawing the fur on the paper. This activity could easily be developed using other tactile materials e.g. sponges, wood etc. An exciting resource using life drawings to create cartoon characters. Young children choose dressing up clothes and then model for each other in brief, energetic poses that challenge the observational, drawing and mark making skills of the class. 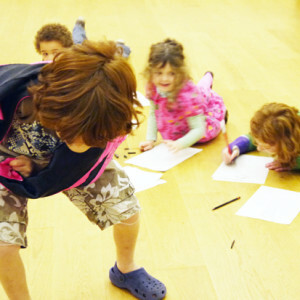 The life drawings are then developed using the children’s imagination into cartoon characters.